It is very hard to find the 1st Mono press in Near Mint condition, perhaps played only several times. The cover remains in its original factory shrinkwrap. Large hype sticker promoting the new Bob Dylan's album in the deluxe set format attached to the shrinkwrap, informing that the album has 2 records. 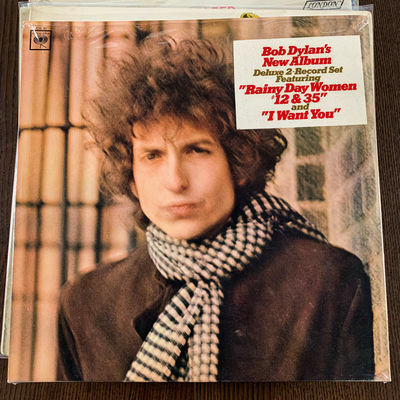 Additionally, the sticker promotes Bob Dylan's two new hits "Rainy Day Women #12 and 35" and "I Want You". There are two versions of the hype sticker. This sticker doesn't contain a full list of tracks, but is also extremely rare. I can state with confidence that this 1st Mono press includes 9 photos inside the gatefold, including the photo of Claudia Cardinale, which was deleted (along with one more photo) on all of the subsequent pressings at Dylan's agents request as they didn't want to use the actress in this way, promoting someone else. I am absolutely sure about this as all of the 1st pressings were supported with the promotional hype sticker. The labels also have all of the characteristics of the 1st pressing, including the "Unbreakable" black banner under the catalog number C2L 41 and the matrix number leave no doubts that this is the very early 1st press: Side A - o XLP 113761-2F - T A///; SIDE B - o XLP 113762-3F A I//; SIDE C - o XLP 113763-4B; SIDE D - o XLP 113764-2A-T. The dead wax area has a large "T" which allows to state that this issue was pressed at Columbia Records' pressing plant in Terry Haute, Indiana. I am trying to be conservative in my grading, but this is indeed a brilliant example, which is very hard to find.